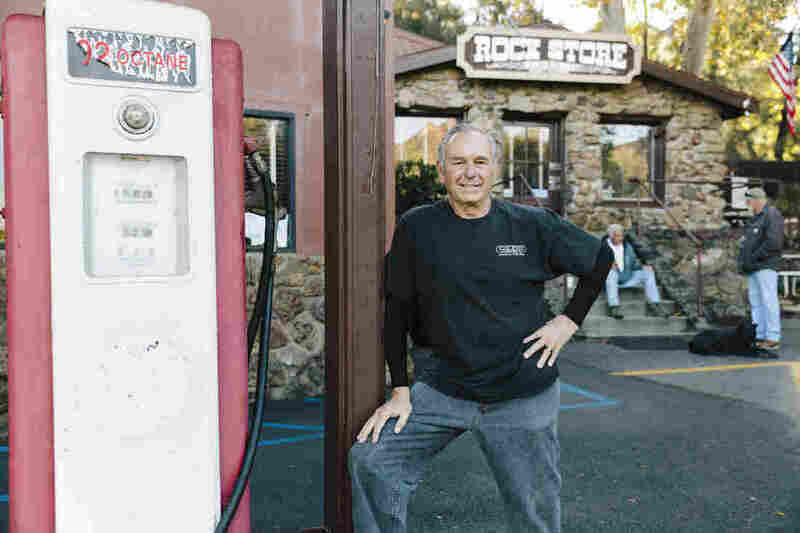 Biker Bar In The Malibu Hills Serves As Bedrock For A Fire-Ravaged Community The Rock Store, run by the Savko family for more than 50 years, is one of the few structures still standing after last month's Woolsey Fire. There, amid the destruction, locals found help and hope. Rich Savko's family has owned the Rock Store in Cornell, Calif., since 1961. The restaurant became a community center after the Woolsey Fire. "People were looking for information, and there was always somebody here that they could get firsthand information from, and that meant a lot to them," Savko says. "Plus they could share their stories and have a cup of coffee." The Woolsey Fire was one of the largest fires in Los Angeles County history. 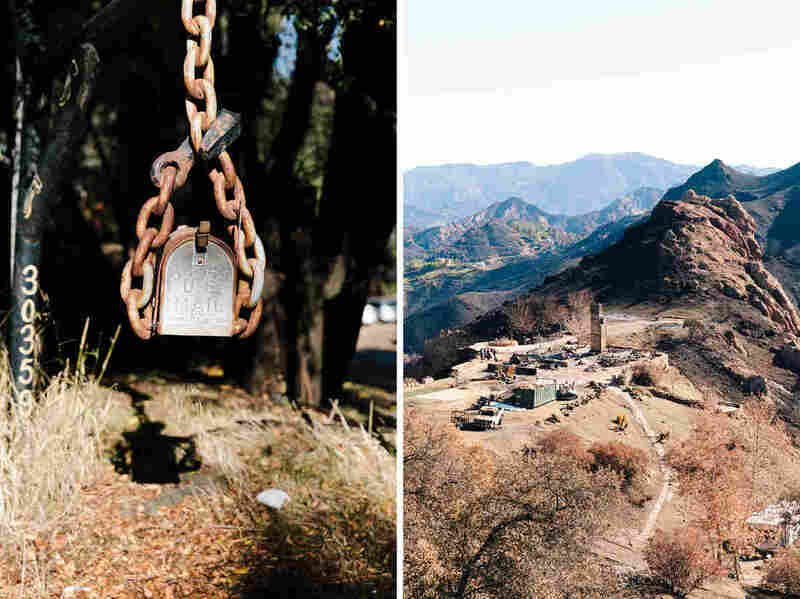 It burned for two weeks, destroying 15,000 structures and decimating almost 100,000 acres. Three people died. Now, more than a month after it swept through the area, the air still smells like ash. The surrounding hills are an eerie blackened moonscape. Burnt rubble and twisted metal are all that's left of whole neighborhoods nearby. Amid this destruction, the Rock Store became a makeshift community center — even without power or a working telephone. Dozens of people rolled through to check in, including actor Keanu Reeves. Built from volcanic rock, the Rock Store building was formerly a stagecoach stop in the 1910s. At first, Ed and Vern Savko opened it as a small town grocery store. Rich Savko and his mother, Vern, at the Rock Store. 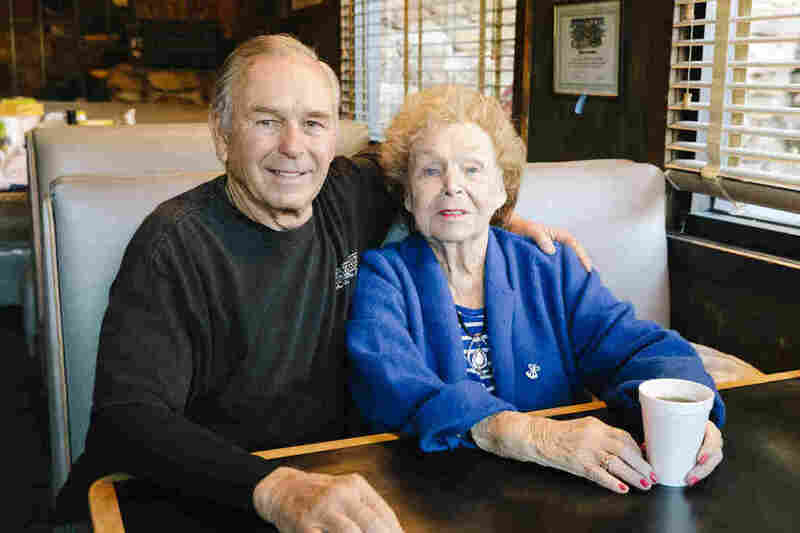 Vern Savko and her husband, Ed, bought the Rock Store in 1961 and ran it, together, until Ed died in 2012. Vern is 90 now, and their son Rich runs the place. Rich Savko set up barbecue pits to cook off all the food they had left and shared it with anyone still in the area. They used a generator to boil water to make coffee that they handed out. The American Red Cross set up shop in the parking lot. Rich hasn't let anyone pay for any of it. Left: A mailbox across the street from the Rock Store. Right: Gary Jones' multi-acre property above the Rock Store once had five structures. Now all that's left is a towering chimney where the main house once stood, shells of burnt vehicles, and a trailer (bottom right) that managed to survive the flames where Jones is now living. "It seemed really tough around Thanksgiving," Savko remembers, sitting outside on the patio. Tears well up in his eyes. "People obviously lost all their homes and things like that, but they sat out here and had Thanksgiving dinner. The guy across the street cooked a huge turkey. People didn't know where they were going to go or what they were going to do, but fortunately we were able to light some battery-powered lanterns and celebrate." On a recent day, even though the bar is officially closed, a few dozen people roll though to check in — including actor Keanu Reeves. A group of firefighters gather in the parking lot. 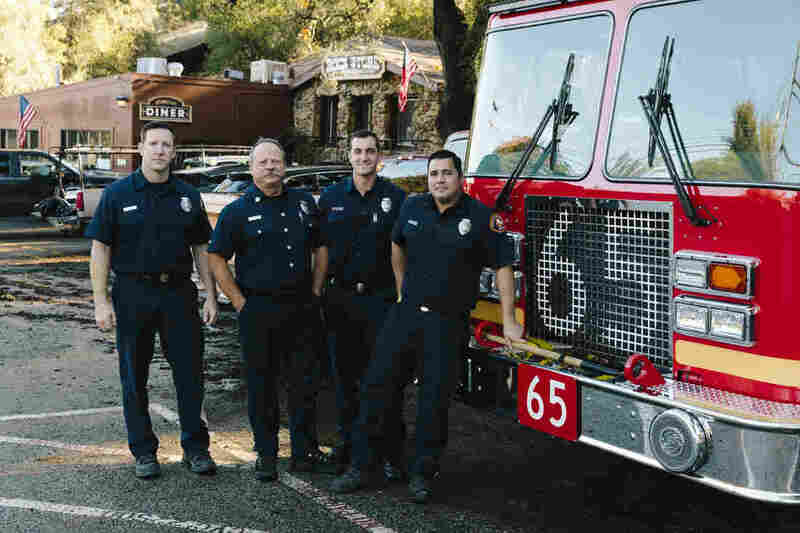 Los Angeles County firefighters, from left: Brian Knutson, Jay Colvin, Adam Young and Marcus Carballo. Knutson lives in the community and says this is the worst fire any of them can ever remember. "It's always hard to talk to someone that's lost their house," he says. "I wish we could have done more for them." One of the people who lost everything is 76-year-old Gary Jones. He's lived on the ridge above the Rock Store for decades. 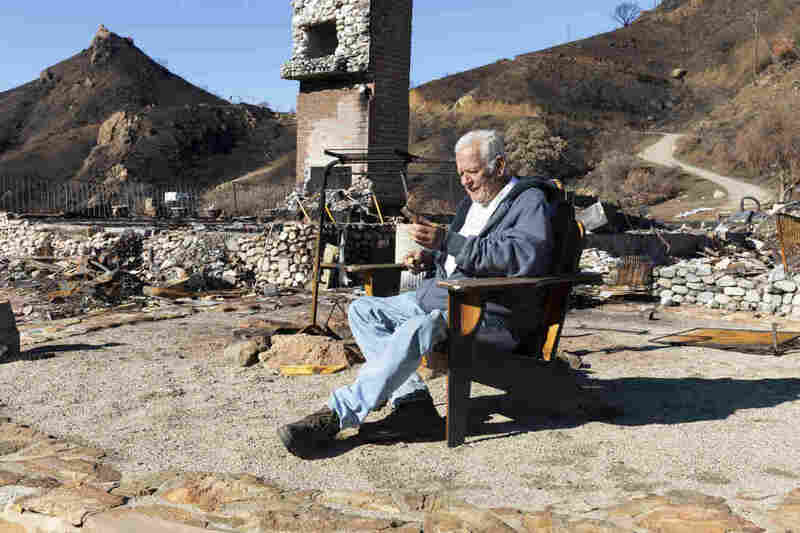 Jones ignored the initial evacuation orders, and by the time he tried to leave, the fire had surrounded his house. He got trapped behind a big metal gate at his property line. "I called my wife and said goodbye and asked her to pray for me," he says. Holding a cigar, Gary Jones sits where his house once stood, in a wooden porch chair that somehow wasn't destroyed. 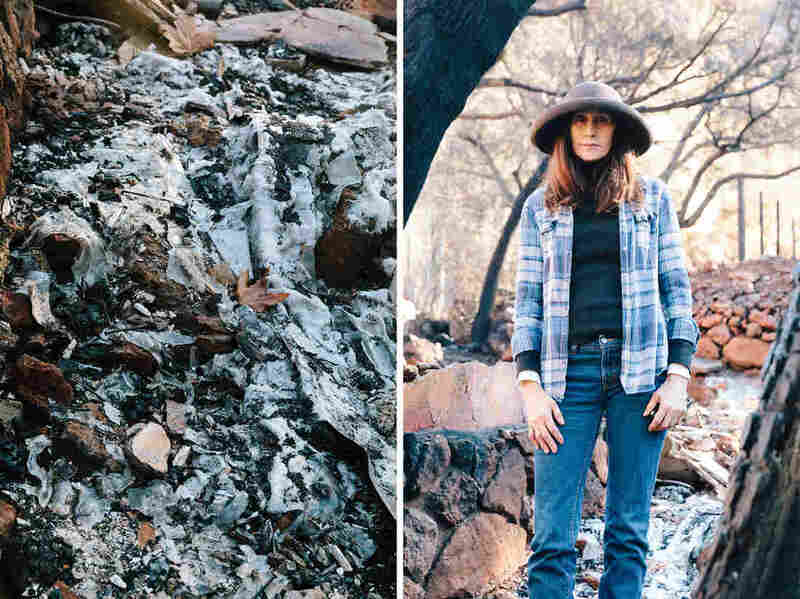 Jones lost three of his five dogs in the flames and came back the next day to bury them. His horse was found alive up the hill and is recovering from burns. 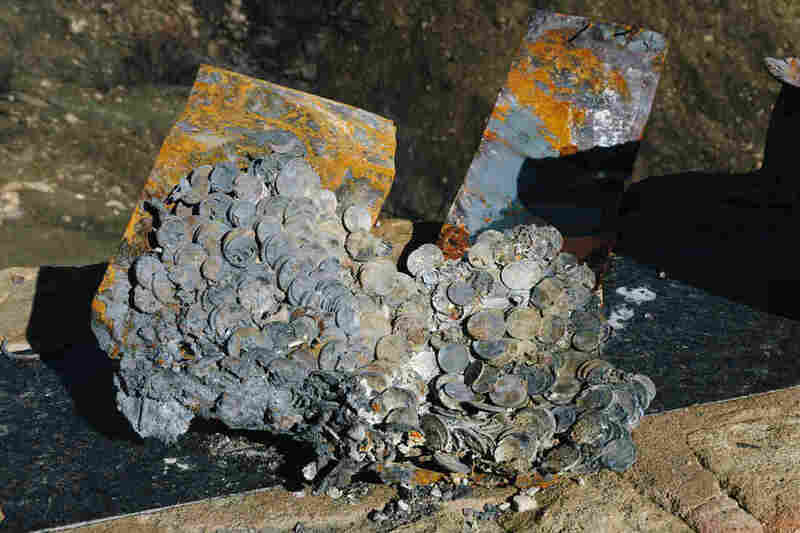 Coins melted together on Jones' property. He had a pot of coins for his grandchildren to pull from when they visited. 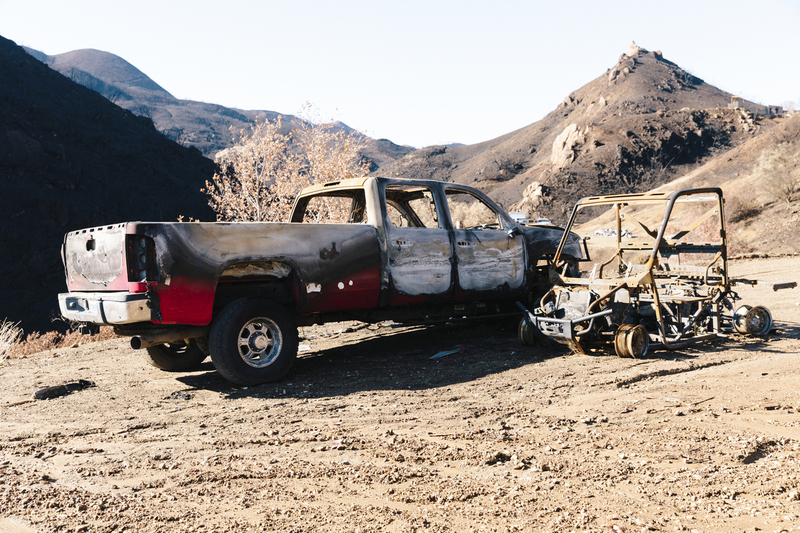 A few of the burned-out vehicles on Jones' property. The truck he used to escape during the fire is heavily blistered by fire, but still intact. After about 10 minutes, he managed to force the gate open and drive through the black smoke down the hill to safety. When he returned a few days later, the house was gone. He had to leave in such a hurry, he lost three of his five dogs. Today, a tall brick chimney looms over a stretch of blackened stone where he used to live. A bathtub is about the only recognizable object in the rubble. A shell of a car sits in a melted garage. "We've been doing some sifting," Jones says, pointing to piles of ash. "I found my wife's wedding ring. Turns out rubies don't melt!" There's not much Jones can do these days. He's waiting for a hazardous materials team to come inspect the mess and authorize him to take everything to the dump. He says he's actually excited. Left: On Linda Rappoport's property, the glass liquefied and flowed like a river, before solidifying again. Right: Rappoport lives behind the Rock Store. The house she had just finished remodeling two days before the fire burned to the ground. Another smaller front house was left standing. She was sleeping when the evacuation orders were announced and awoke to the fire surrounding her property. "This is a blessing in disguise," he says. He had storage containers on the property, containers "full of decisions that haven't been made yet." "And when you finally clear out the storage container it has a feeling of cleansing. That's kind of what I feel like. All the problems I had were gone," he says. "I've got some new ones now. But you know, everyone talks about turning the pages of a book and it's true — I'm turning the pages of a book, but the book is getting more interesting." These days, the signs of progress are small. Residents are combing through property, hoping to find mementos that survived the inferno. Roads are opening and power is being restored. Shoots of grass are starting to poke out of the ashy soil. 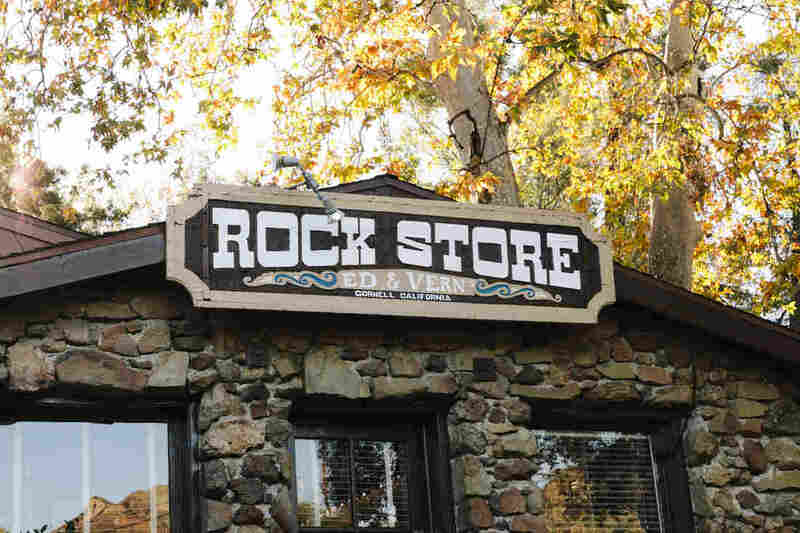 And last weekend, the Rock Store officially opened for business for the first time since the fire. The smells of frying bacon, pancakes and coffee cover up the scent of ash in the air. Vern Savko, who bought the place more than 50 years ago, sits in a booth drinking tea, looking around at her grateful customers. "It's so great to see everybody, you know? They were worried about us, so it's great. I cry every time I start ...." She trails off and her eyes fill with tears as she scans the blackened hills around the store. "But we're here."